We just wanted to pass on the biggest thank you for all of your support over the last six months. We learnt so much from you in the hypnobirthing classes and during yoga. The most significant thing that I took away from classes was a deep trust in my body and its ability to work with our baby to have a positive birth experience. And Jared said the hypnobirthing classes made him feel very prepared and that he would be an integral part of the birth process, which he was. Also thank you so much for the session we had together when I was at 42 weeks, it really prepared us mentally to have a different start to labour than what we had planned. As you know I really didn’t want to be induced and was concerned with the prospect of cascading interventions, however for the health of our baby it was agreed that at 42+1 it would be best to be induced due to my ongoing high blood pressure. At 8 am on the 26th April the obstetrician administered one lot of gel, and to my surprise my blood pressure was normal so I started alternating between getting Jared to rub Clary Sage on the pressure points near my ankles and hands where you had recommended, listening to the rainbow relaxation meditation and going up and down the set of stairs at the hospital. I pretty much got a comment from every passerby on the stairs wishing me good luck which was really nice. By midday I thought I should take a rest so we went back to the room and I did the meditation again and about 10 minutes in my membranes released, we were so incredibly happy, and hopeful that I wouldn't need any further induction. We ate lunch and then I hit the stairs and started walking around the ward, by 1:30 I was having regular surges every 3-4 minutes. I thought it would be great to have a good laugh to get the feel good hormones going so I put the comedy show ‘come fly with me’ on. I lasted about an hour doing this while on the exercise ball, but the laughing was making the surges more powerful and I was having trouble regulating my breathing. Jared was the most amazing support, he rubbed my back and reminded me that I was doing amazing after every surge. By 5 pm my obstetrician came and checked on me everything was going well except that I had been vomiting a lot, so I was given something to stop the vomiting, and he felt everything else was going well and left us in the care of our midwife. My surges were only 2-3 minutes apart at this stage and lasting between 45-70 seconds. My mum who is a midwife and Reiki master had been on standby to come in when we needed her, and I really knew I needed her energy by this point. She started doing Reiki as soon as she arrived and was able to support me so that Jared could take a short break. By 7:00 pm I was desperate to get into a birth pool, but all of the birth suites were full, so I alternated between sitting on a ball and standing in the shower. Some of my surges were only 30 seconds apart and I was really starting to struggle, I really wanted a drug free birth, however opted to try gas. It made me feel pretty loopy but helped take the edge off the surges enough to get me through. By 8:00 pm a birth suite became available and I was so keen on getting there before my next surge started I tried leaving my room completely starkers (much to the midwife’s horror, who was trying to tell me there were other people on the ward and I couldn't go there naked), I really didn’t care all I could think of was how nice it would be in the water. My mum tried her best to preserve my modesty with an ill fitted gown and off we went. I was only in the pool a short time before I started to involuntarily bear down I couldn't help it, the midwife was concerned that I was wasting my energy and that I wasn't fully dilated. I said that I thought I was only about 10 surges off pushing the head out. I wish at this stage I had listened to my intuition but I was asked to get out of the pool so that they could check how far I had to go. It was hard getting out of the water and onto the table, I was told that I was at 9 cm and that there was a small amount left to dilate. The midwife asked me not to push and give my body time to dilate, I couldn't stop from bearing down during my surges and just let my body do what it needed to. I tried my best to use the breathing down technique that I had practiced so rigorously since learning it at hypnobirthing, it definitely was a much noisier version that what I had practiced (Jared likes to say that I did a good battle cry during this stage). Throughout all this time Jared and mum were there supporting me and telling me I was doing great. I continued in the water for another 30 minutes or so, the midwife felt that I wasn’t effectively using the surges to get the baby out and then they had trouble finding the babies heart beat. I was asked to get out of the pool out of concern for our baby. I thought that I was going well so I checked if I could feel the head, and I could! I was so excited and knew that we would be meeting our baby soon. I felt that getting out of the pool was the right thing to do at this stage, and wanted to know that the baby was okay. As soon as I got out of the pool and onto the table I was told the baby was fine, and after another surge I was told that they could see the head. I remember Carrie telling us about the importance of taking the crowning slowly and to give my body time to stretch, and even though I was being told to push, I just listened to my body, it took about 5 surges to birth the head. I then got a bit of a break before the next surge when the rest of the body was birthed. At 10:06 pm our baby was placed on my chest, Jared told me that we had had a boy. The umbilical cord was left for about 20 minutes until it had completely stopped pulsing. I had requested a natural third stage and birthed the placenta around 30 minutes after our baby. Not long after this I had a significant bleed and the midwife requested to administer oxytocin, which I agreed to. After this we had a beautiful quiet time with our new baby, he was so alert after being born, his measurements were taken about 4 hours after his birth, it was so lovely to have this quiet bonding time together. Luka was 3.56kg/7lb 12oz, 51cm. Jared and my mum were integral to the success of our birth experience and they were both 100% on the same page in using hypnobirthing techniques. Their words of encouragement, reciting my favourite hypnobirthing mantras, Jared using all of the support techniques that we had learnt in class and practised at home, and his constant reminders to breathe. 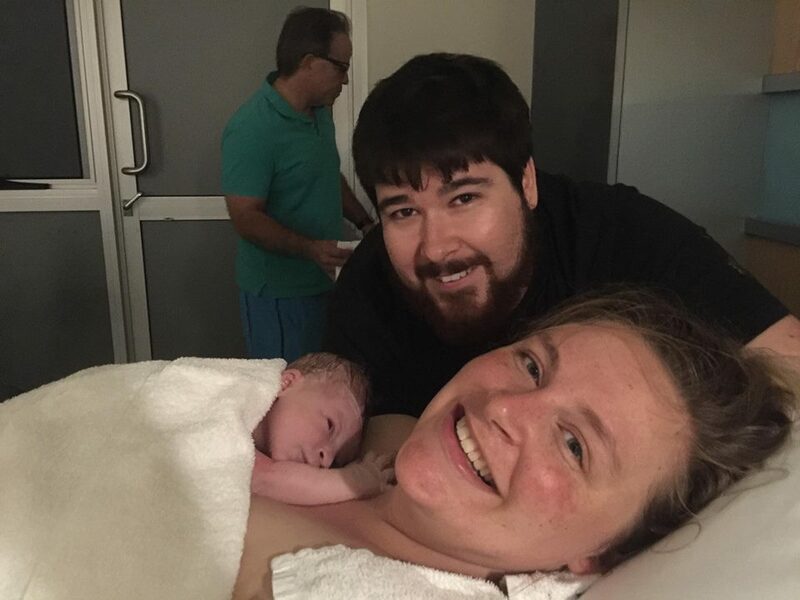 Before starting classes with you Carrie I was fearful of birth, by the end of our classes I felt empowered and excited and that’s how Jared and I felt at both the start and end of the day our son Luka was born. Jared said the hypnobirthing classes made him feel very prepared and that he would be an integral part of the birth process, which he was. The most significant thing that I took away from classes was a deep trust in my body and its ability to work with our baby to have a positive birth experience.